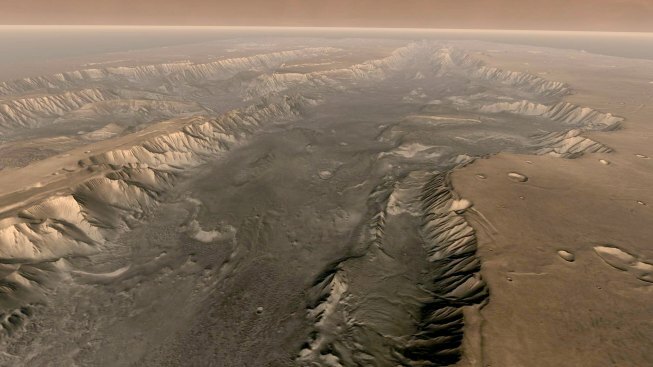 There is still no firm evidence that Mars has ever hosted life. Crafty detective work based on data from NASA's Mars rover Spirit has uncovered large amounts of a rare type of Martian rock that adds more evidence that the red planet may have harbored liquid water in the ancient past. The rock outcrop is rich in carbonate minerals and was found in the Columbia Hills, an "island" of low hills at Spirit's Gusev crater home on Mars. Spirit visited the outcrop in 2005, before it got permanently stuck in its current Martian resting spot. Carbonates are minerals that contain carbon dioxide and form readily in the presence of water. So, if the conditions were such that carbonate-bearing rocks were able to form, this would suggest that at one point, water — and possibly an environment favorable to primitive life – was likely present in the region. "Carbonate forms as a precipitation product from water, so there has to be water around for them to form in the first place," the study's lead author Richard Morris, a planetary scientist at NASA's Johnson Space Center in Houston, Texas, told SPACE.com. There is, however, no firm evidence that Mars has ever hosted life. Until now, geologic clues for the presence of carbonates on the Martian surface have been relatively scarce. In contrast, carbonate-rich rocks (such as limestone) are plentiful on Earth, where liquid water abounds. The discovery of the carbonate-rich outcrop came as a surprise to researchers, since plenty of rocks that did not contain carbonates were previously found in the surrounding area. "[The rocks] were found on the southeast lobe of Husband Hill in the Columbia Hills," Morris said. "As Spirit was coming down slope on Husband Hill, we encountered a lot of rocks that don't have carbonates. We ran into this outcrop, analyzed it, and noticed that it was very different at the time, but didn't really appreciate why until pretty recently." The Spirit rover actually visited the outcrop, called Comanche, back in December 2005, and while initial measurements were taken, the significance of the finding only recently became apparent. "It took us a long time and a lot of detective work to figure this out," Morris said. Spirit and its robotic twin Opportunity have been exploring different parts of Mars since they landed in January 2004. Now in their seventh year on Mars, the rovers have far outlasted their initial 90-day mission. Last year, Spirit got stuck in deep Martian sand and NASA gave up trying to extract it earlier this year. The rover is currently hibernating and may not survive the harsh Martian winter. Opportunity, meanwhile, is doing fine as it heads to a huge crater called Endeavour. Last month, the rovers broke the record for the longest mission on the surface of Mars. The researchers employed the full suite of Mars Exploration Rover (MER) instruments to make their discovery, including the Alpha Particle X-ray Spectrometer, which provided an early clue by detecting the uncharacteristic excess of light elements in the rock, and the Miniature Thermal Emission Spectrometer (Mini-TES), a mineral-scouting instrument that identified the carbonate minerals. When Spirit initially visited Comanche in 2005, the Mini-TES, which was developed at Arizona State University (ASU), had been unable to readily detect the carbonates in the rock because the instrument was partially blinded by Martian dust. "Mini-TES got dusted months before Spirit reached Comanche, and we didn't have a good way to correct for the dust effects at the time," said Steve Ruff, a research scientist at ASU's Mars Space Flight Facility, and one of the study's researchers. "We knew there was something weird about the outcrop's spectrum as seen by Mini-TES, but couldn't say what caused it." "Spirit's Mossbauer spectrometer indicated that carbonate was possible, but I didn't believe it," Ruff added. The researchers developed a calibration to remove the spectral effects and correct for the dust that had gotten into the instruments. Combined with the Mossbauer data and chemical data from a third spectrometer, the Mini-TES was able to confirm the carbonate minerals in the Comanche outcrop. The precise sizes of the rocks are difficult to measure, Morris said, because a lot of them are buried beneath the Martian surface. "There's a large outcrop that is roughly five meters (about 16 feet) across," he said. "The ones we did most of the measures on were mostly 1.5 meters (almost 5 feet) across." The research is detailed in the online June 3 edition of the journal Science. The researchers are hoping that analysis of the rocks' composition could also provide evidence for how they were formed. "The Martian carbonates have a bit of an unusual composition," Morris said. "This has got to be telling us something. The next step is to look into the processes that formed these carbonates." The mineral is rich in magnesium and iron and possibly originated via hydrothermal processes – forming through precipitation from the hot, residual waters from leftover magma that flowed through buried deposits of carbonate minerals, said Morris. Moving forward, the researchers will now examine terrestrial records to find carbonates that have similar compositions to those found on Mars. Knowing how much carbonate is present in the rock will allow the scientists to use analog examples from Earth to understand how they might have formed. Scientists have been searching for carbonate rocks on Mars for decades, as such minerals are crucial to understanding the early climate history of the red planet, and the tangential question of whether Mars might once have hosted life. In fact, small amounts of carbonate minerals have previously been detected on Mars. The Martian meteorite ALH 84001 contained approximately 1-2 percent carbonate, and until the Comanche discovery, was thought to have the highest concentration of carbonate of the rocks found on Mars at the time. The Comanche outcrop, however, is far more abundant, containing between 16 and 34 percent carbonates. Morris believes that there is a possibility that carbonate-rich rocks could also be found in other regions of Mars. Carbon minerals have been detected in the Nili Fossae region of Mars, which is about 3,900 miles (6,300 kilometers) away, opening the door to similar findings in the future. Ruff said "the Comanche data have been available to scientists and the public for about four years now. The new finding shows that this data set still harbors potentially major discoveries." "Do other surprises await us?" Ruff wondered. "Who knows? But I'll make a strong prediction: More discoveries will be made with old data."